A couple weeks ago when Dad got his annual deer I brought the liver into work with me for Chef who made staff meal out of it. What started out as a one time thing quickly snowballed into what I hope is a regular event whereby I bring in a ‘secret ingredient’ and Chef has to create something out of it. In the second week I followed up on the venison theme and brought in a couple chops. This past week, in an effort to bring in something other than venison, (although I could have continued that one for a while, we’ve got lots of it in the freezer) I brought in morels. They were picked and dried this past Spring in my backyard, the same place Dad got the deer. I have an interesting backyard. Whereas venison can logically be made into an entrée since most entrées are based around a protein, it takes a little more effort to turn morels into the star of a dish. Not that they don’t deserve it though, I love morels. And although their flavour is wonderfully earthy, I’m sure part of my love for morels comes from childhood memories of hunting for them with my parents. We would go to the same spots year after year and Dad and I would always have to first acquire the perfect ‘morel stick’ to help us find the well camouflaged mushrooms. Once I found a morel I would call out to Dad to come see it and he would hand me his smooth silver pocket knife to cut the morel off at the base. I would then cup the morel in my hands and bring it up to my face to take a deep breath, convinced that once I had the scent of the morel, I could find more of them. But I digress, back to the challenge! 1- Morel Jelly: Created by steeping morels in water and using the resulting liquid along with some veal stock, sherry and agar agar to create a firm morel jelly which could then be cut into cubes and used as plate garnish as well as in the morel cream sauce. 2- Morel Cream Sauce: A combination consisting mainly of morels, fennel, onions, cream and the above mentioned morel jelly. 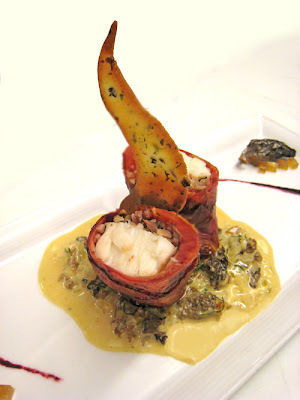 3- Morel and Bacon filling: A small dice of morels and bacon, used to top the halibut before it was wrapped in the potatoes. 4- Morel Tuille: To appease my need to bake Chef demonstrated how tuilles could be used in the savoury world. Finely chopped morels peppered a wavy tuille, made by using a template. Posted by Brilynn at 12:24 a.m.
Wow, that looks amazing! 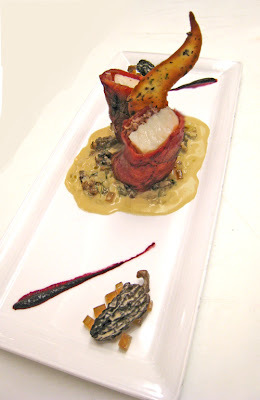 And I love all the ways the chef used the morels. I'd only be able to do one thing...eat them. Morels grew wild where I grew up. We used to go mushroom hunting every spring. It was so fun. I miss those days! I love the look of those beet-painted potatoes, and would love to know more about that. Interesting backyard? There's an understatement! That is an incredible plate of morels! 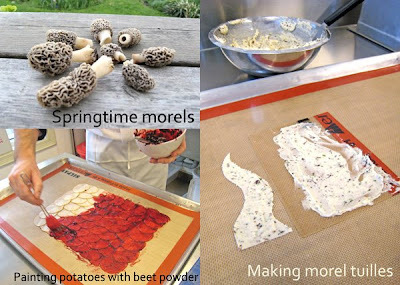 I love your posts, and the morel tuiles are giving me all sorts of ideas. All I have in my backyard right now are squirrels! This sounds like it belongs on Iron Chef. 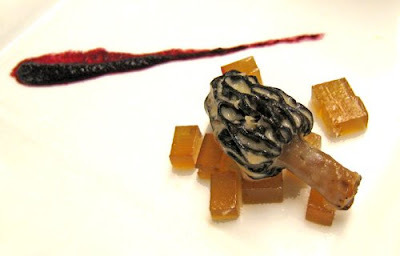 The morel jelly is pretty cool, I would like to try to make that. Thanks for sharing! Holy hell! That dish is awesome. I'm so glad you wrote about it...can't wait to try some of these components.